Army and Marine Corps ground troops bore the brunt of the American casualties in the Vietnam War. Serving aboard a Navy ship off the coast may have been comparatively safe, but part of the US Navy was right in the thick of things too: the Riverine Patrol Force. 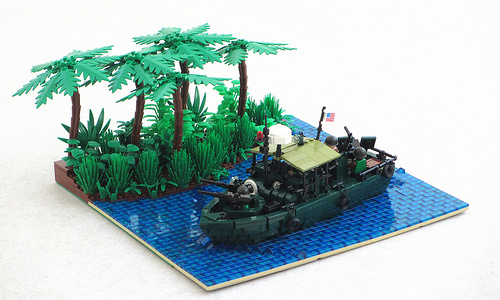 They operated on South Vietnam’s many rivers, in particular in the Mekong river delta. Hot on the heels of my USMC Seahorse helicopter, this weekend I built one of their boats: a Patrol Boat Riverine, which, like just about anything in the military, had its own abbreviation: ‘PBR’, which was typically pronounced as ‘Pibber’. These were small and fast boats that could operate on some of the smaller tributaries of the Mekong, often surrounded by jungle, with crews living in stifling heat and primitive conditions. 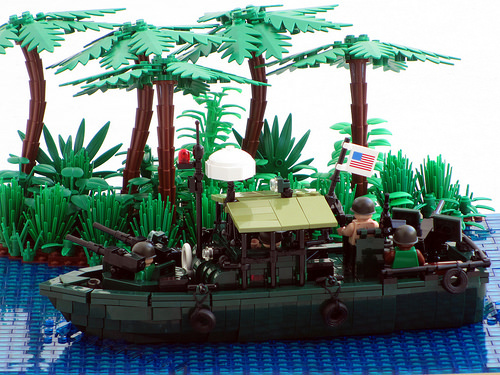 This type of boat was made famous by Francis Ford Coppola’s Apocalypse Now, a war movie whose ‘Making of’ is at least as memorable as the movie itself. The making of my model was considerably less of a psychedelic trip than the journey described in the movie. Despite the dark green, which is still a somewhat awkward colour to build with, it came together very quickly. The diorama will be part of a collaboration and for it to fit with the other builders’ styles, the boat has very few visible studs. I built its hull mostly with bricks on their side, which gave me both a smooth deck and a nicer shape. I used BrickArms M60s and helmets as accessories for the minifigures, but the rest is all LEGO, including the luscious jungle foliage.